It's the kind of rare opportunity that members of the 9/11 Truth Movement wish would come more often. Gage explained to viewers that his organization, representing more than 2,200 architects and engineers, is focused on the science of the event and on calling for a new, independent investigation. He encouraged viewers to visit the AE911Truth.org website and watch the landmark video 9/11: Explosive Evidence – Experts Speak Out. "Every one of our [C-SPAN] viewers today should be calling their Congressmen and Senators and finding out why they're not investigating the worst act of mass murder in U.S. history and the third-worst structural failure in modern history," Gage said. "This is an extraordinary and unacceptable situation." Host Peter Slen told viewers that Gage was brought in as a guest because Washington Journal had received so many calls in recent months asking its other guests to address the issue of how Building 7 fell on 9/11 when it was not hit by a plane. The invitation shows that the continuing efforts of 9/11 Truth activists to bring the issue to the attention of the public are not in vain. Slen read excerpts from the Frequently Asked Questions section of the National Institute of Standards and Technology website, which gave Gage the opportunity to explain how NIST fails to address the forensic evidence that AE911Truth's building and technical experts have accumulated, including the symmetrical destruction of Building 7 at free-fall acceleration, the explosions reported by first responders, the evidence of thermite in the dust, and the molten iron found in the rubble of all three towers. Gage also pointed out that at least two media outlets — CNN and the BBC — reported the destruction of Building 7 before it actually occurred. Several excellent questions were asked by Washington Journal callers, most of who made intelligent points about the subject and had supportive comments about AE911Truth. 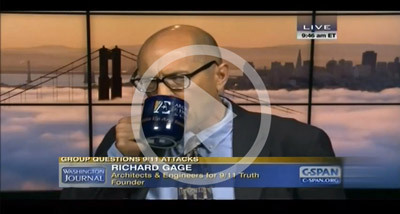 The appearance by Gage on C-SPAN as well as recent attention given by the media to the High-Rise Safety Initiative offer real hope that the ongoing efforts of the 9/11 Truth Movement are starting to show some significant results.